US President Donald Trump presided over his first UN Security Council session but faced opposition from member states on his unilateral policy, particularly on Iran issue. 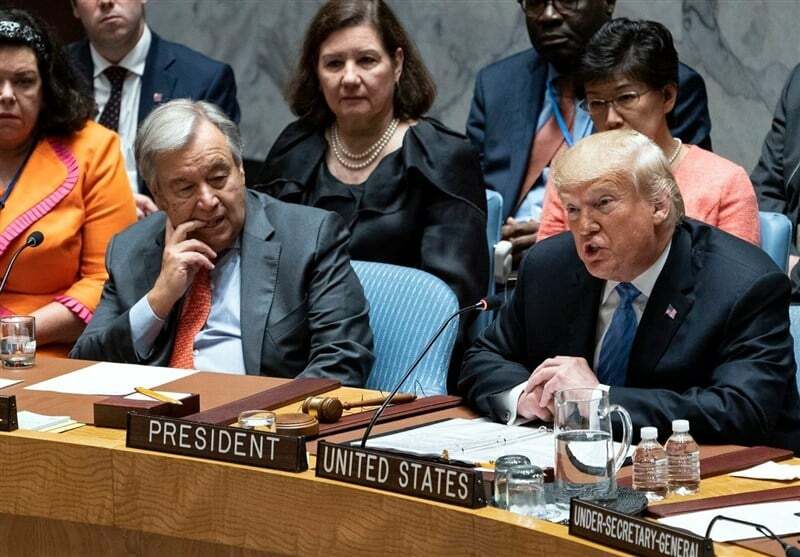 The UN Security Council meeting on the non-proliferation of weapons of mass destruction was held Wednesday, one day after trump attacked Iran at his General Assembly speech. During the Wednesday session of the UNSC, Trump renewed old allegations against Iran and reiterated his harsh criticism of Iran. Trump also accused Iran and Russia of “enabling” “butchery” in Syria. However he also thanked all three countries for pulling back from an offensive against militants in Idlib. After Trump, French President Emanuel Macron said that a “serious crisis of confidence” has emerged after US President Donald Trump’s decision to withdraw from the Iran nuclear deal. He added that since the deal was signed, the “pathways of the signatories of the JCPOA have diverged…but we still, all of us here, retain the same objective of preventing Iran from obtaining nuclear weapons, and guaranteeing strict international control on the peaceful use of their nuclear programme”. Bolivian leader Evo Morales launched a blistering critique of US policy toward Iran as well as Trump’s immigration policies that resulted in the separation of migrant children from their parents. Bolivian President Evo Morales went further, linking Trump’s actions to a broader US history of intervention in countries such as Iran. The session came a day after Trump anti-Iran remarks at General Assembly meeting. Iranian President Hassan Rouhani responded to Trump’s anti-Iran remarks, saying the US administration is violating the rules of international law by withdrawing from the 2015 nuclear deal that Iran reached with six world powers, including the US.